Colors, flowers, a little vintage, a little modern, simplicity and elegance, bold but delicate. All of these are things I love. I also love to make things. Last week all of them came together in this little project and I still feel giddy about it. I’m a member of the Utah County Modern Quilt Group (ucmqg) and I’d known for months that I wanted to make a hoop for their hoop challenge. I even had a plan but when sewing time came I had no desire to make what I’d planned. I decided to start with something I felt excited about and see where it led. I’ve been doing a lot of hand sewing lately, specifically, hand applique. 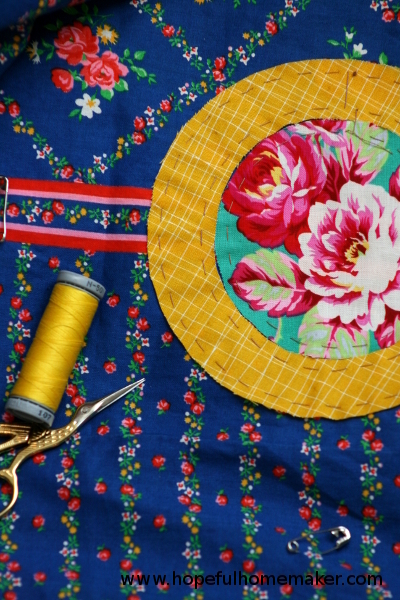 Once upon a time I had a lot of sewing time during the winter but as my children have grown the winter is really busy and for the most part I’m only sewing on the go. I’ve started several patterns by Carolyn Friedlander and am loving the process of making them, so I decided to try her Trudy block which is available on Creativebug. 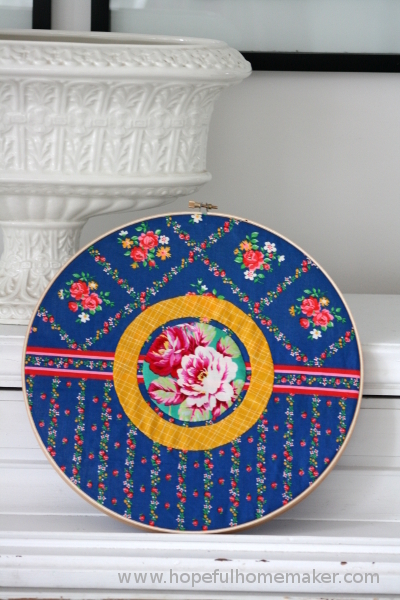 I knew the block was too small for my 12″ hoop so that led me to look at my fabric differently. I wondered if I could find something that would do the work of filling the space with interest, and would also showcase the applique. I tried to remember everything I learned last year from Australian designers like Kathy Doughty and Jen Kingwell, how they mix modern and vintage and use unexpected fabrics to make heroes of the combination. 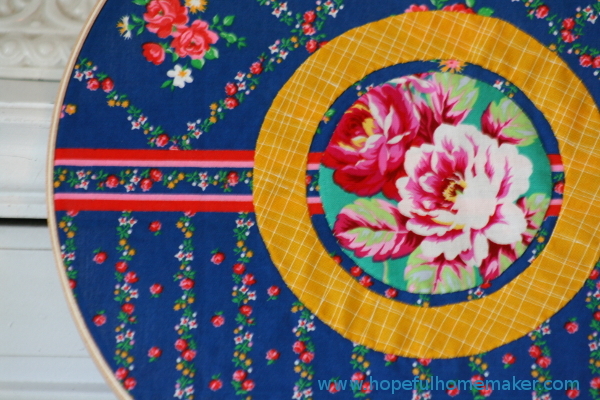 My thoughts immediately went to this vintage fabric I’ve been “saving.” The perfect blue, I decided to center it carefully in the hoop and see how the circular block would look with it. 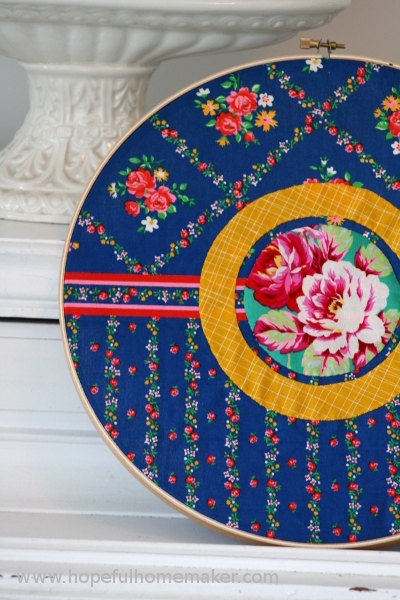 The yellow was an easy choice for the outer circle and I decided a floral would fit nicely in the center. The fabulous Jennifer Paganelli print was the first that came to mind; I’ve been saving it too. It worked. And I love it. And it’s so ME. It’s what I’ve always loved mixed with where my tastes are moving, who I’ve always been and who I’m becoming and where I’m trying to go. 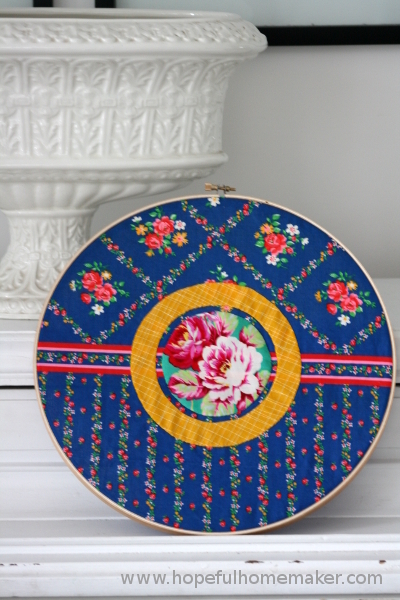 Perhaps that’s all a little much for something as simple as two circles in a wood embroidery hoop, but it’s how I feel. Making this block made me hungry to make! The very best creative harvest, if you ask me. I like it! Nice photography!